Carlile earned three awards, for Best Americana Album ("By the Way, I Forgive You") and best American Roots Performance and American Roots Song for "The Joke." Gaga earned Best Pop Solo Performance for "Joanne (Where Do You Think You're Goin'?)" and shared the prize for Best Song Written for a Visual Medium for "Shallow" from "A Star Is Born." Childish Gambino's hit "This Is America" earned prizes for rap/sung performance and music video. Ariana Grande, who last week canceled a planned appearance on the show, earned her career-first Grammy Award for Best Pop Vocal Album for "Sweetener." And former Soundgarden frontman Chris Cornell was recognized posthumously for Best Rock Performance for "When Bad Does Good." 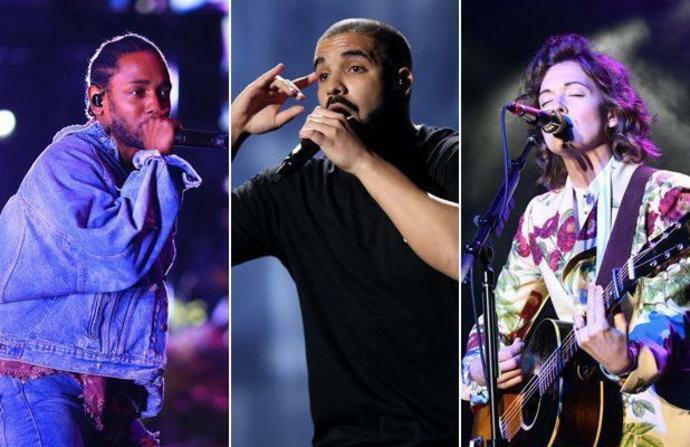 Drake, Carlile and Lamar were all recognized in the three biggest categories - Album, Song and Record of the Year - for their most recent albums, "Scorpion," "By the Way, I Forgive You" and the "Black Panther" soundtrack, respectively. Alicia Keys is hosting this year's ceremony, which takes place at Los Angeles' Staples Center. "Don't Fence Me In" - John Daversa, soloist. Track from: "American Dreamers: Voices of Hope, Music of Freedom"